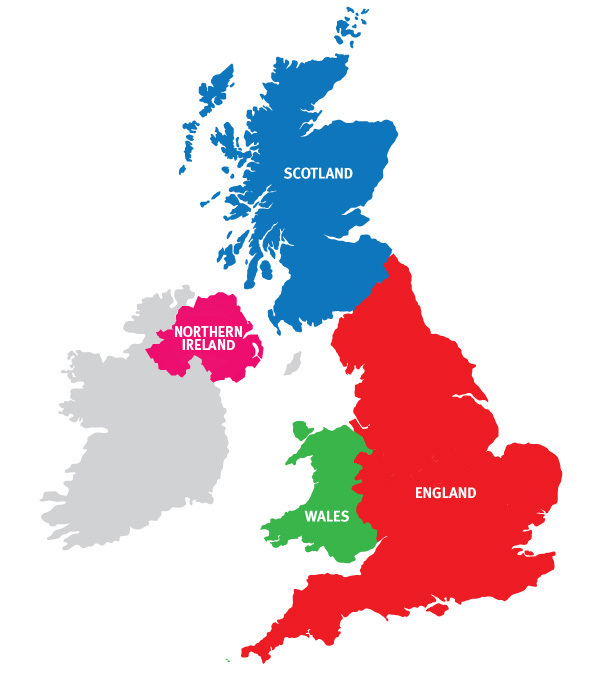 The United Kingdom, also known as the UK, Great Britain and Britain, is a sovereign state made up of four nations - England, Scotland, Wales and Northern Ireland, as well as the Channel Islands and the Isle of Man. Rich in tradition, complex in culture and endlessly diverse… it’s partly down to its unique constitution that the UK is such an endlessly fascinating place to discover. Whether you’re in the United Kingdom (UK) for the first time, or have lived here your whole life and are looking for new places to visit, UK travel is all about variety. It’s about unearthing a mixture of iconic sights and hidden gems, ticking famous landmarks off your bucket-list one day and stumbling across a quirky local museum the next. It’s about taking the plunge into a vast wealth of activities, whether you’re an adrenaline-junkie, a die-hard hobbyist or simply fancy trying your hand at something new – from abseiling and mountain-biking to hiking and pony trekking, seal spotting, bird watching and more. And, of course, the UK’s diversity is mirrored in its landscape too. From its rugged coastline studded with gold sand beaches and secret coves, to rolling countryside dotted with patchwork fields and crops of ancient woodland, to vertiginous peaks set above glistening meres and heather-clad moors, via kitschy seaside resorts, pretty-as-a-postcard villages and handsome market towns, there’s no shortage of places to visit in the United Kingdom. Meanwhile, UK city breaks offer something to satisfy all wallet sizes and tastes, be it fascinating history and heritage, cutting-edge culture and museums, indulgent retail therapy or decadent dining and nightlife. For many visitors to the UK, their first port of call is England – home of Shakespeare, Sherlock Holmes and ‘Pride and Prejudice’. There’s energetic and ambitious London, steeped in iconic landmarks, world-class museums and royal parks, whilst Cornwall’s balmy climate and surf-ready beaches promise a more chilled-out stay. Up north, Northumberland’s starry skies and vast, unspoiled landscape stretch endlessly before you. Manchester hums to the sound of its football chants and a stomping nightlife, whilst friendly Liverpool impresses with its Beatles heritage and jaw-dropping architecture. There are enough things to do in the UK to keep each day fun-packed, whatever your holiday style. Lovebirds in search of romantic breaks may look towards countryside and coast – strolling hand-in-hand along the beach, gazing up at star-studded skies or packing a picnic basket for a riverboat cruise. Prefer city breaks? You’ll find just as much romance amongst the bright lights, Michelin-star restaurants and dazzling entertainment venues of England’s vibrant cities. School holidays are a breeze thanks to any number of family-friendly activities. Kids can learn outside of the classroom whilst fossil hunting on the beach or discovering how the Tudors and Victorians lived at one of the UK’s evocative castles and stately homes. There’s plenty for youngsters with boundless energy as well, be it swinging through the forest on a treetop adventure or learning to kayak. As England’s weather gets warmer and a blanket of colour falls across the landscape, spring breaks are an ideal time for finding things to do in the great outdoors. Put the wind back in your sails with a sailing holiday, strap your walking boots on for a ramble along country paths or take your pick from amongst the UK’s spring festivals. The UK has a tremendous range of accommodation to choose from so it’s worth pinpointing your budget and the type of experience you’d like. As well as hotels and B&B’s, there are some quirky options too, ranging from farm stays to log cabins, canal boats to tipis. Or if you simply want something that won’t burn a hole in your pocket, then you can’t beat a youth hostel or campsite for value for money. B&B’s are a great choice for visitors craving that home-away-from-home feel, run by hosts who pride themselves on delivering a personal touch. You’ll find them scattered across the UK in all manners of guises, be it a cosy country cottage or elegant Georgian townhouse. Hotels enjoy equal variety for those willing to splash a little more cash. You may find yourself huddled beneath the sheets in a haunted castle, treating yourself to a spot of pampering from the comforts of an elegant Grade-listed mansion or gazing out onto a stunning cityscape from a contemporary boutique hotel set in a buzzing, central location. Whilst your accommodation will be happy to provide you with tourism information, you might want to check out the local tourist information centre (TIC) as well.